Thinking of giving your dining table a festive makeover this year? Enjoy browsing through our range of Christmas themed tablecloths for a design to suit your colour scheme. 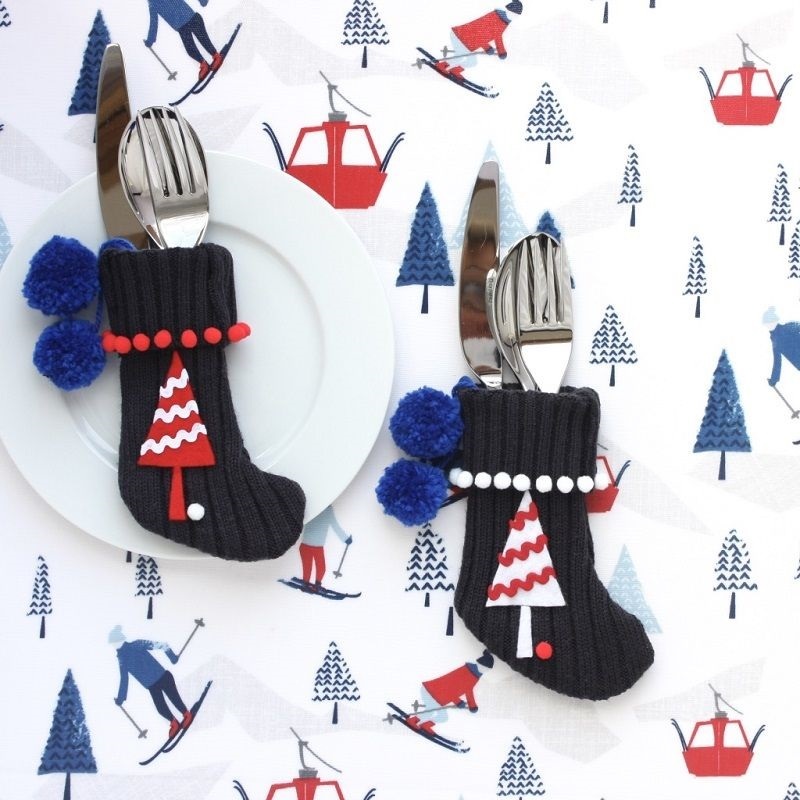 We thought the Christmas Alpine Tablecloth was calling out for woolly decorations, so we made some mini stockings to hold the cutlery, but they could be filled with chocolates, fudge or small gifts. These cute little stockings are cut out from the sleeves of a re-purposed knitted jumper and decorated with pompoms and felt shapes. They’re so easy, here’s how we made them. Create a card template in the shape of a Christmas stocking. Turn the jumper inside out and lay it flat with the sleeve folded down the seam. Line up the template on the sleeve so that the cuff will become the top of the stocking. Use a thin line of chalk to draw around the template and pin the two layers of the sleeve together before machining or hand stitching along the chalk line. Cut out the stocking shape leaving a small allowance outside of the stitching. Turn the stocking the right way out and fold over the top cuff. Repeat with the other sleeve. If you need to make more than 2 stockings, you can use the bottom of the jumper if that has a cuff too. You can then spruce up the stockings with coloured decorations to match your colour theme.